Two or three times a year, I take on the city with my two favorite sidekicks. My little boys Jack and Alex, trade in their jeans for suits, and out on the town we go. To everyone’s shock and awe, we ended up braving the theater in the blustering cold and a snow storm. Watching my little men spin around in the snow under the marquee made it worth standing in the freezing cold. 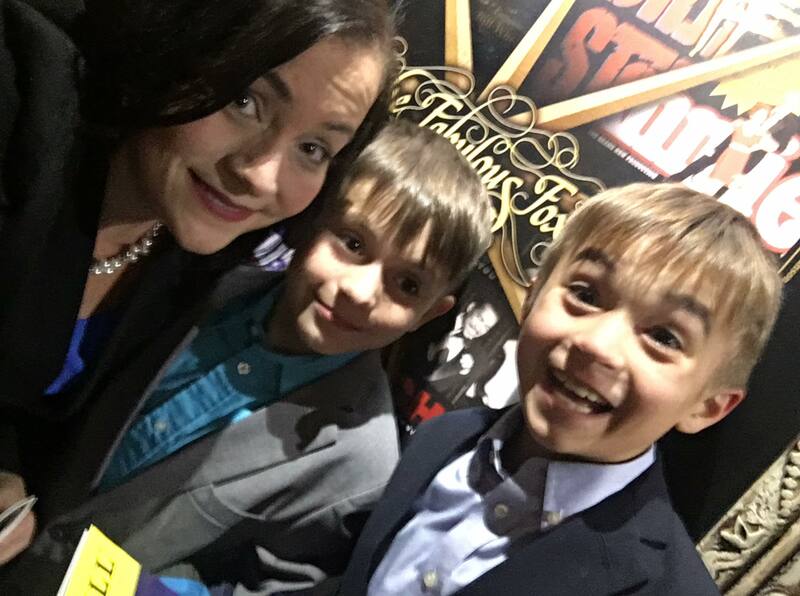 I love taking my boys to the Fabulous Fox Theater. We always make a point to go to Peacock Alley on the Fourth level, and check out a new set of show collages. 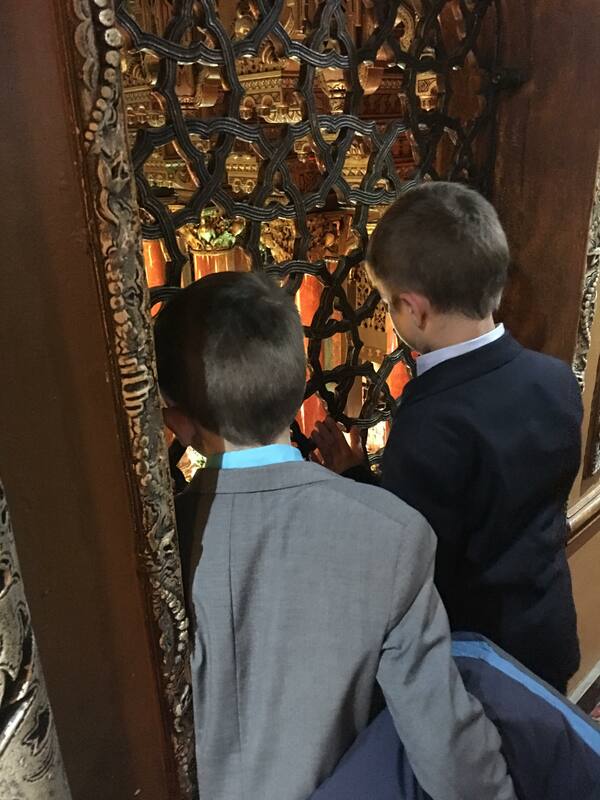 This place is the perfect place to take your kids to see something special. Each trip, when the lights dim to be seated, my kids get so excited. One of the ushers always lets them play the xylophone, alerting the other patrons that its time to find their seat. The excitement was building as the jovial genie (Michael James Scott) hits the stage. My little boys are on the edge of their seats soaking up his every word. 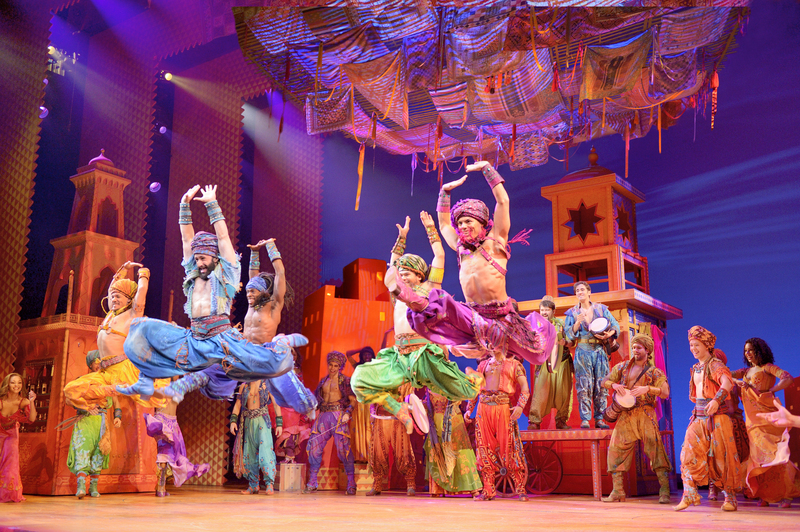 The musical Aladdin was adapted to the stage from the 1992 animated hit. As most know, that have followed Aladdin from the animation phase, the genie has big shoes to fill. The original genie, our beloved Robin Williams, turned this jovial wish granter, into an animated icon. The larger than life personality was complimented by the comical villainous half-wit, Iago, played by Gilbert Godfrey. Those are big shoes to fill, both comedians still bring joy and laughter decades later. Michael James Scott was a perfect fit. This larger than life personality was filled with sass, and caused my family to lose it laughing, multiple times. The other characters all had notable performances, but everyone knows that Aladdin without an amazing genie, would be like Queen without Freddy Mercury. The genie makes or breaks Aladdin. Starting with “Arabian Nights” this show is a colorful, quickly moving, whirlwind that takes you back to 1992. It was attention grabbing from the first line to the last. The meet-cute, a street rat named Aladdin (Clinton Greenspan) is in the market place, trying to find some dinner with a five finger discount, when he meets a beautiful woman in the market who is trying to shield her appearance in a hood (Lissa deGuzman). Things were about to go south, when the guards were closing in to capture them and princess Jasmine revealed her true identity telling the guards to unhand her at once. The theater transforms into a colorful, dreamscape designed by Tony-winning Bob Crowley, and Natasha Katz. The costumes designed by Gregg Barnes were beyond amazing. Designs rich in detail and deep hues that you would expect from a dream set in the middle east. It took Barnes 6 hours to draw and paint one costume sketch. All costumes are custom made, by hand, out of 2039 different fabrics. There are 337 costumes in this show and in the finale number each mens costume has 8644 Swarovski rhinestones on it. Jasmines wedding dress weighed 12 pounds, due to the crystal beading. I can not even explain how amazing the detail is in these designs. This production was directed and choreographed by the amazing Casey Nicholaw. The Tony Award winning director/choreographer that brought us Spamalot, and The Book of Mormon. Nicholaw, in my opinion, synonymous for larger than life shows that will keep you laughing for days after you see it. 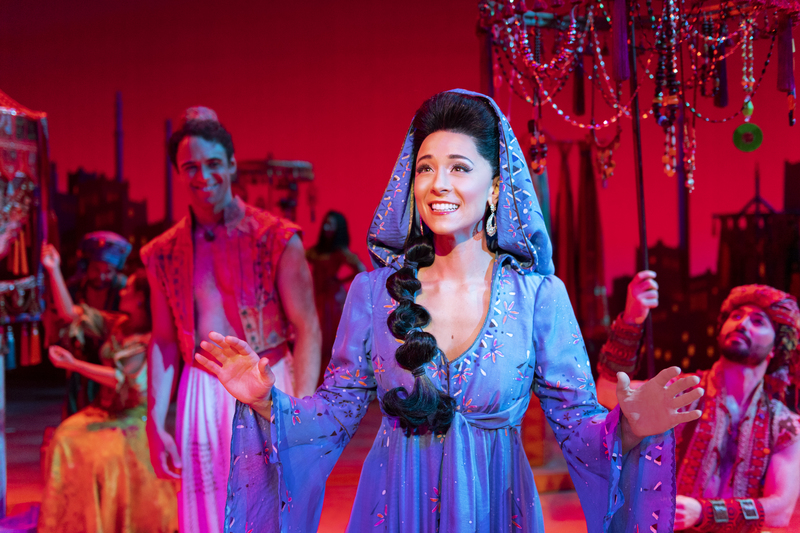 Aladdin and Jasmine, Clinton Greenspan and Lissa deGuzman, make an adorable pair. The chemistry between the two, creates a great night at the theatre. Aladdin, a street rat with all his charm, is bound to have an entourage. Aladdin, along with Babkak (Zach Bencal), Kassim (Jed Feder), and Omar (Philippe Arroyo), usually end up in more trouble than they intended, but you and your family will enjoy their peril. 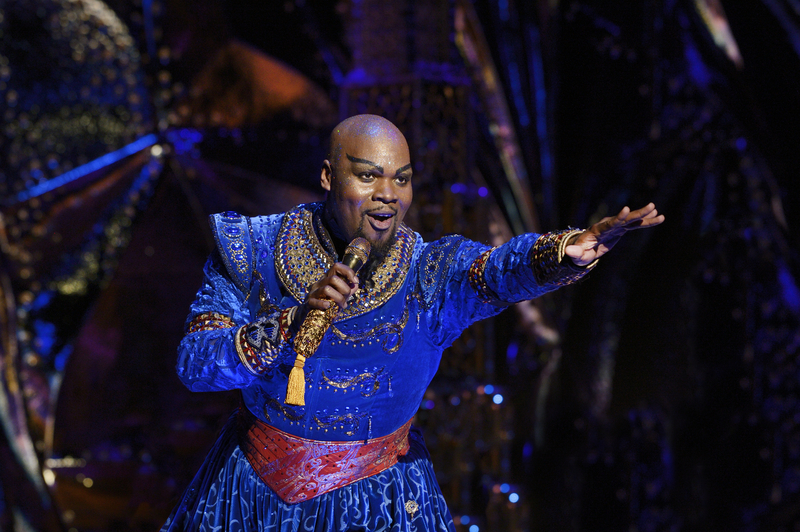 The Sultan (Jerald Vincent) is a pushover when it comes to his daughter, but he insists she marries a prince. His character is sweet and kind. Everything little girls hope for in their Daddy. Oh Jafar (St. Louis’ own Jonathon Weir) is a half step off in his scheming. Jafar is a lot more funny in the stage production than he was the animated version. And last but not least, I can finally answer everyone’s question. How did they transform Iago? Once bird, now hilarious jester-like sidekick, to Jafar. In this stage production, Iago is played by the fantastic Jay Paranada. His charisma and animated personality, is soooo funny. In my opinion, I prefer the man over the bird any day. With one quick rub, Aladdin meets a genie that is about to change his life. The genie offers Aladdin 3 wishes, and Aladdin offers in return to free the genie from his captivity. The group takes a magical journey as they transform a street rat and his friends, into a Prince Ali and his royal court. Now its up to Ali to use his charm, to win her over. Come take a magic carpet ride. You will love it.